Lemons have a fresh, tart taste that many adults love, but they don't make an ideal food for babies. At best, babies are likely to reject a lemon's sour flavor; at worst, your baby could have an allergic reaction or develop a diaper rash after eating lemons. Wait until your baby becomes a toddler to introduce lemons. Babies naturally gravitate to foods with a mild, sweet flavor, which is one of the reasons pediatricians often recommend bananas, rice cereal, peaches, sweet potatoes and applesauce as first foods. Babies are unlikely to appreciate lemons if you offer them. Avoid citrus fruits, including lemons, until your baby is at least 10 months old, according to Maple Avenue Pediatrics, especially if you have a family history of food allergies. Citrus fruits are highly allergenic, and the earlier you introduce them, the greater the chance that your child could develop an allergy. Lemons are highly acidic and may aggravate gastroesophageal reflux, or GER, causing poor feeding or irritability. Avoid feeding lemons to your baby, even if he doesn't have GER. The acid can cause stomach upset or even contribute to diaper rash. Acidic foods, such as citrus, are also known to cause diaper rash, according to Dr. Lauren Feder, M.D., author of "Natural Baby and Childcare." 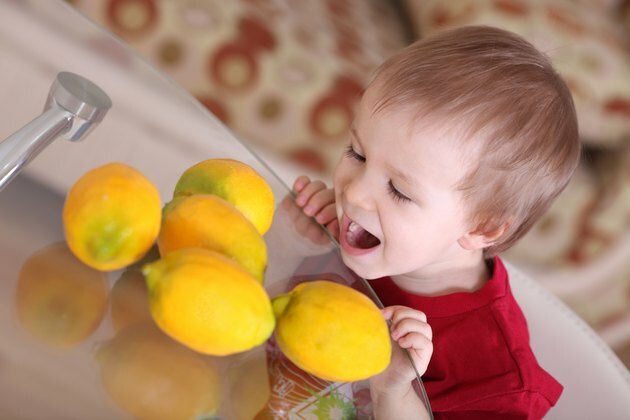 Most babies won't eat lemons if offered, but even if your child seems interested in lemons, wait until at least 10 months and even longer if you are concerned about food allergies. Introduce one food at a time so that you can easily identify a food sensitivity or allergy. When you begin introducing citrus foods, offer a small amount of diluted juice first. Can Drinking Orange Juice Make Your Stomach Hurt? Are Oranges Acidic or Alkaline?